The Falls Trail is littered with numerous long rock gardens and rugged root beds. Trail running gets rugged along the rocky singletrack. It’s perfect for intermediate runners looking for a technical twist. There are 13 trails that range from .25 miles to 4 miles, and total 27.5 miles. Most of the trails here are singletrack scattered with rock gardens and exposed root beds, but there are some wide, flat hard-packed dirt surfaces with long, gradual ascents and descents. This is a perfect spot for intermediate runners looking for technical trails. You can run for a couple of hours or a whole day. Twin Falls is open and beautiful in all seasons. Leaves cover the ground in the fall, though, and hide rocks and make the trails slippery. Most trails are very narrow and have large drop-offs, so while the park is technically dog friendly, it might be best to keep pets around the camping areas and not on the trails. Twin Falls Resort State Park has 13 trails and spanning 30 miles, where trail runners can test their skills. Whether you are looking for a dash around countless rocks and roots, or winding paths over rolling hills and along mountain ridges, this park has a challenge waiting for you. Figure in the year-round greenery, countless creeks, and cascading waterfalls, and you will realize why Twin Falls is one of the best-kept secrets in southern West Virginia. Trail runners love exploring Twin Falls Resort State Park’s rugged trails in untamed, West Virginia wilderness. For a quick warm-up, take the short .25-mile Twin Oaks Trail, and turn right at the end to head up the .75-mile Buck Run Trail. The run starts on a wide, flat stretch along a creek bed, and turns into a steep ridge that narrows into singletrack on hard-packed dirt. Once you’re on the ridge, cruise down a steep switchback with rolling hills before passing through 2 long rhododendron tunnels near the end of the trail. For a more technical run, start on the 1.5-mile Falls Trail. After a short paved start, the trail quickly turns more technical with intense rock gardens and large, gnarly root beds, so be ready for a rough ride. It does pass a waterfall or two, so at least it’s easy on the eyes, if not the legs. And, you can take comfort in knowing that it doesn’t go uphill. 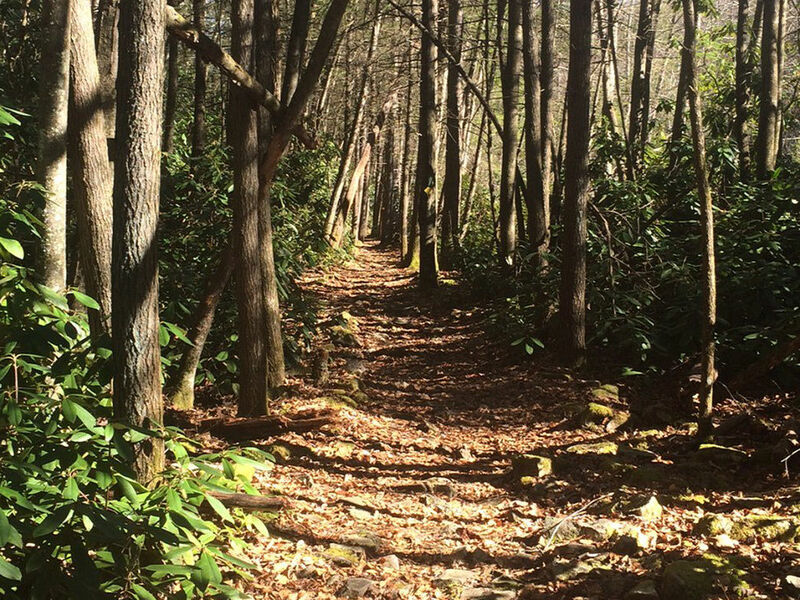 The Falls Trail then connects with the Nature Trail, a 1.5-mile smoother route full of rolling hills that drop along several tiny creeks and then rise up along ridges. Lots of trees have fallen over this trail, so be prepared to duck. Once you reach the pine forest, you’ll know you’ve made it to the top. Now you’ve earned the steady descent back down that makes the trek up worth every bead of sweat. Intermediate trail runners will have a great time challenging their skills here. Rock gardens and root beds are confined to flat stretches, letting you gain technical experience without worrying about climbing. If you are an experienced trail runner, you can also also have a good time here, since there are plenty of highly technical trails with tough ascents and sharp descents to test your mettle on. To reach Twin Falls Resort State Park, take Exit 42 on I-64/I-77 at Mabscott and continue straight until the road splits. Take the right ramp that leads to Mullens, Route 54 South. Brown State Park signs will direct you the remainder of the way. The park is 26 miles off Exit 42.